Atlantic City International airport (ACY) is both civil and military airport, just 10 miles northwest of Atlantic City, New Jersey. Civil aviation part provides commercial and general air transportations, offering air travel services to support commerce and tourism growth of the State. Airport provides non-stop flights to eight most popular cities in United States and dozens connected flights. Atlantic City International Airport is your gateway to the South Jersey shore region. 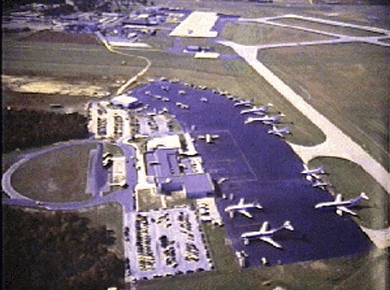 Atlantic City Airport includes one terminal and two runways, and operates more than 1 million passengers every year. It is served by Spirit Airlines. The military part is a base for the New Jersey Air National Guards (State air force militia), and United States Coast Guard (multi-mission service forces of USA). Atlantic City Airport parking represents a six-story garage building with an indoor walkway within a few steps from the Terminal. There is a choice among Short-Term Parking, Economy Parking and Garage Parking. Parking lots are open 24/7. Surface parking takes a few minutes’ walk and shuttle service is available from the Economy parking area to the Terminal. There is also a special Overflow Lot that will only be available when both the Economy AND Garage lots are full. All Atlantic City parking lots are free for the first 15 minutes, after this time daily or hourly rate applies. Atlantic City long term parking includes Economy Parking, which costs $10 per day and Garage Parking which costs $13 per day. Atlantic City Short-Term Parking charges $2 for the first hour and $1 for each additional hour up to 4 hours, past 4 hours daily maximum of $20 applies. Don’t forget about Atlantic City airport parking coupon system. By using Atlantic City parking coupons, you can save your time and money, reducing parking charges! If you'd rather not park in a remote garage or lot, you can book a hotel room with Free Parking nearby. There is a number of parking options in the city including metered parking, hotel parking, and street parking. The closes area is in White Horse Pike, which takes only 5 minutes’ car ride from the Atlantic City airport. Nightly price for staying in a hotel room starts at $20.